With regards the centenary of the First World War, this is without doubt one of the finest, if not the best book published so far this year. Not only is it powerful and poignant, mesmerising and melancholy, it visually and orally transports the reader back to a totally different place in time; wherein European pride and morality didn’t have to be promoted and monitored through the court(s) of law, but was rather, inadvertently instilled from birth. One need only fleetingly glance at any one of these painstakingly reproduced, all prevailing photographs, to ascertain and realise an era that was so very different to that of our ever increasing, morally bankrupt own. Whilst researching a documentary on the First World War, brothers Florian and Gunnar Dedio, two film-makers, stumbled upon an extraordinary cache of photographs collected by Germany’s first media tycoon, August Fuhrmann. Several thousand hand-coloured, glass plates had lain abandoned for decades in a warehouse on Rostock, Germany. And once these were aligned with assorted letters, diaries and relative memoirs of the day, the brothers must have surely realised their veritable treasure trove of history: ”In preparation for filming, we read extracts from over 1,000 diaries, letters and memoirs of men, women and children from all the nations involved in the war. We wanted to find out how it felt to experience the conflict from different viewpoints: as a mother, son, father, lover, soldier or nurse. We selected quotes from these eyewitnesses to include in this volume, and feel that they give every photograph an additional emotional dimension” (‘About this Book’). This, the photographs most resoundingly do; which fundamentally explains why The Great War Diaries is almost un-put-down-able. Indeed, once this wonderful book is opened, it is, for some unfeigned reason, akin to gazing through a book of one’s own family photographs. Such is the unquestionable, yet all resonating familiarity, which, in an oddly reflective kind of way, speaks volumes so far as our own subliminal sense of history is concerned. For instance, the full size photograph of the former Stettin Station in Berlin on page 23, jumped out at me immediately. Might this be because I lived in Berlin for a number of years and am still interested in its history? Or might this be because of the familiar architecture of the buildings on the corner of a busy intersection, which I recognise, in the knowledge that Stettin Station no longer exists (due to it having been almost completely destroyed by bombing during the Second World War)? These eight chapters do much to convey the true horrors of the front line and the challenges of the home front – throughout the European theatre of war in its entirety. 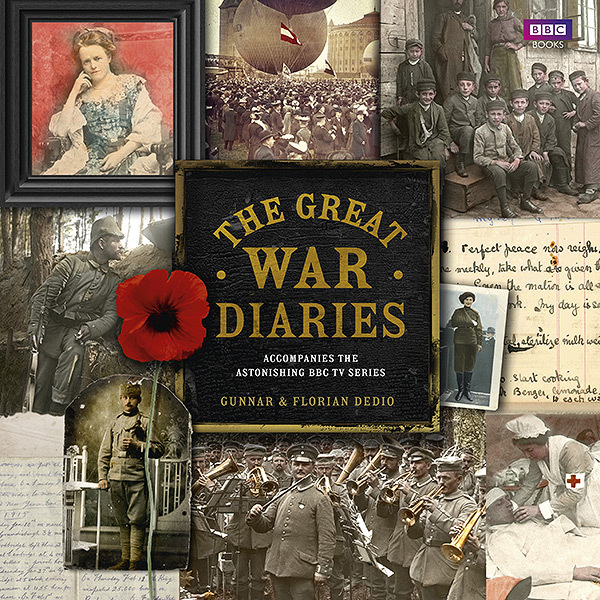 From Holland, Belgium and France (the former of which was neutral throughout the campaign), to Germany, Poland and Russia, The Great War Diaries depicts strength and suffering, hope and despair in equal measure. If you only buy one book to commemorate and try and understand – if not come to terms with the First World War – then this should most definitely be it. This entry was posted in History and tagged BBC Books, Berlin, Florian & Gunnar Dedio, Marcel Proust, Stettin Station, The First World War, The Great War. Bookmark the permalink.